London’s successes with congestion pricing demonstrates how such policies can be a powerful tool for curbing traffic, encouraging walking and cycling, and raising revenue to support public transit. Photo by mariordo59/Flickr. In 2003, London adopted a program of congestion pricing that now places a roughly $17 (£11.50) daily fee on motor vehicles entering central London. The effort was expected to reduce car traffic, air pollution, and emissions in the area, and has since been lauded as a major success. Beyond these benefits, congestion pricing has also saved lives by reducing the number of fatal traffic crashes caused by cars, increasing physical activity from cycling and walking, and limiting exposure to air pollution. 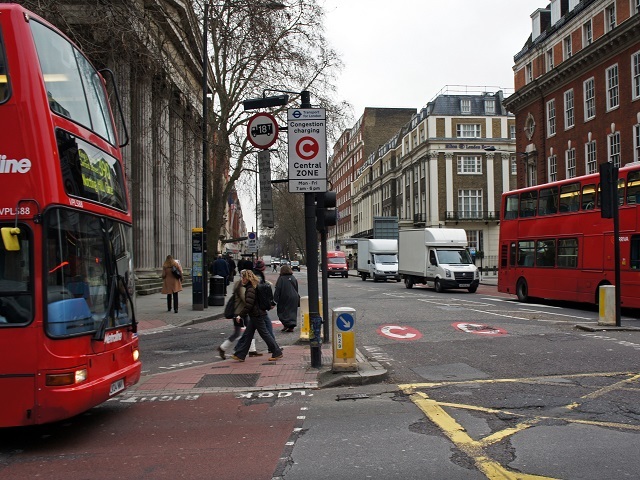 A new study by researchers in the United Kingdom shows that, since the introduction of the congestion charge, there have been 30 fewer monthly traffic crashes in central London—a 40 percent decline—and a comparable fall in fatalities and injuries. This reinforces the conclusions of a previous study from 2006 as well as global research that transport pricing policies can bring important safety benefits. Cities considering congestion pricing should ensure that the revenue generated is used wisely. EMBARQ research suggests that congestion pricing initiatives should include complementary projects within the pricing zones that enhance mass transport, walking, bicycling and public spaces, as congestion fees can be a consistent source of revenue. Without adequate support and investment, programs may not prove successful or may even result in less safe conditions, like if fewer cars end up driving faster. London has smartly dedicated revenue from its congestion pricing program to finance mass transport and infrastructure upgrades. According to a report on road pricing from the United States Federal Highway Administration, of London’s $222 million net revenue in 2008, 82 percent went to bus improvements, including exclusive bus lanes, electronic fare payment, stricter enforcement of bus lanes and parking restrictions, public transportation signal priority, and low-floor and accessible vehicles. Another 9 percent went to roads and bridges, and the last 9 percent to road safety, pedestrian and cycling facilities, neighborhood planning, and green infrastructure. The investments have clearly paid off. According to Transport for London, the London Underground now runs 5 percent more train-miles on the Tube, and bus usage reached a 50-year high in 2011, with a 30 percent service increase and a 20 percent waiting reduction. London has added new cycling infrastructure downtown—taking space away from cars—and plans for expansion are currently in development. While the amount of vehicle traffic has fallen by 25 percent over the last decade in central London, the number of cyclists has doubled, and now account for a quarter of all traffic during morning rush hour. Mayor Boris Johnson also recently announced a ban on the type of Lorries (trucks) considered most unsafe to bicyclists and cyclists. The positive results seen in London are akin to the experiences of other cities taking on car traffic. Stockholm—another city with a congestion charge—has also seen improvements in safety and air quality and has also dedicated revenue to public transport and street redesign. In Seoul, South Korea, though not congestion pricing, the city knocked down an elevated expressway, replaced it with a linear park, and implemented a network of dedicated busways. There, traffic crashes went down by a third and air quality improved as well. In Beijing, where restrictions on vehicles entering the city based on license tab numbers are already in place, discussions of congestion pricing are currently underway, and include the possibility of dedicating revenue to mass transport, walking, bicycling, and public space improvements. An excessive number of high-speed vehicles on our roads puts people’s lives in danger. This is simple physics. Effective tools like congestion pricing, traffic calming, street redesign, and limiting vehicle usage can strengthen road safety and improve quality of life of all residents.